Puppy Raiser: Jay A. & Micki R.
Oh my gosh! I am one lucky pup. I got to hang out at Hero Dogs at the end of the year, and man, does it make a puppy feel all warm and fuzzy. Or maybe that was because I was running around with my four legged friends and rolling around in the mud. I got a taste of kennel life, and I think I'm going to have a blast. I'm going to move into the kennel permanently in the middle of January. I can't wait. Frozen kongs with pumpkin! A yard! Outings. And four legged friends! I'm an only-pet at home, though I do live in a building with all sorts of other dogs. I love the dog watching on my walks, though my puppy raisers say I get distracted from "getting busy" easily. Speaking of distractions, while I was at the kennel, I GOT A PRESENT. A stocking full of presents to be exact from the awesome people at FitzAuto Mall. I swear, the Hero Dogs staff know all the best people. Not only did I get to hang out with another fun puppy sitter recently, but those kennel volunteers were fun too. They are constantly spoiling me and my friends, and even the Heroes that come to partner with us. 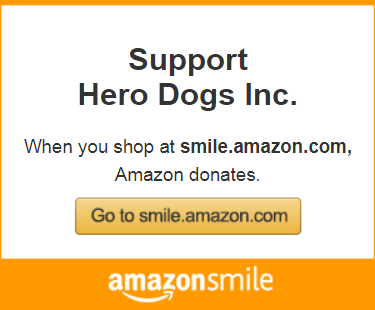 Did you know that Hero Dogs Inc. provides services free of charge with lifetime support of the partnerships? That's pretty cool. But I'm getting distracted. Again. My puppy raisers helped me get rid of the packaging on the stuff when we got home again, and it has been awesome. I got a soft steering wheel (my new favorite toy), a squeaky blue tennis ball, another kong for them to fill full of treats, some doggie treats, and a tire toy. Normally I get a bit carried away on the soft toys, and next thing I know, its in pieces, but M has been watching out, and this stuff seems to be pretty durable. Hopefully, I can make it last, and can pack it all with me when I move into the kennel. See you then! The days are getting shorter, and my days are getting more predictable. I have been working on the basics... "Go through". Every door. Every elevator. Approach and Sit. Wait. Person on end of leash opens door, and says "Go through". I go. I turn. I sit. And then "Yes"~ a TREAT! When I really want to "Get Busy", its hard to stay patient, but rushing through just means I have to go back through and try again. Especially in areas that I go all the time, its so easy to just walk through, but M has been forcing me to slow down. She's been on my case about "tailgating" doors that are already open. It's so tempting, as the door is already open! But she tells me she is worried about my tail getting stuck in the gate. If I wait patiently, she can make sure the coast is clear and she is blocking the door to prevent it from swinging back on me. But the hardest thing to remember is to check in on my raiser rather than rush off into the great beyond after the door opens. Turn. Sit. Wait. "YES" - I got it! I've also been working on relaxing. Sounds easy you say huh? I don't know. It seems like every time somebody asks me that, its cause they are grooming me. And I like grooming, and want to be involved. It's hard to stay still, but I've been practicing a little bit of wait with that. Next up is going to be getting groomed while standing. I have to get used to not keeping an eye on the proceedings. I mean, first you stress eye contact while walking at heel. And at side. And while sitting. And now suddenly, not so much? It's been a lot for me to wrap my brain around, but all in a dog's work. Click here to read Kirby’s full blog.